Hey, so you and I are pretty cool, right? We’ve gotten to know each other a bit, enjoyed a few laughs, had some good times just hanging out and talking about video games. That’s why I feel comfortable sharing a confession with you… I never really liked Sonic the Hedgehog. Wait… where are you going? Come back! Part of it was the character. I was pretty “meh” about him in the 90s, and even then he seemed like the creation of out-of-touch adults trying too hard to project cool they thought kids would respect. Sonic’s alleged “attitude” was little more than a sassy finger waggle and a smug expression. He seemed like just another mascot trying to “relate” to youth, much like the equally insipid anti-drug toons of the Nancy Reagan years (except McGruff, who was a boss pimp). I didn’t care much for his game either. I blame two points for that. The first was the lack of any kind of save system, so all I really remember of the entire game is playing the first two zones. Second, I kept feeling betrayed by all these promises of speed. The commercials were all “WHOA!! BLAST PROCESSING, DOOD!” and I’d start the game up ready to have my face melted with raw 16-bit speed. And in the time it took for Sonic’s feet to blur in a circle like the Road Runner, I was diving into spikes, or tripping over an enemy and chucking all my rings into the air. Here was a game touting speed that punished you for going too fast. Maybe I just didn’t “get” Sonic. And indeed, my impressions of the first two zones of the first game kept me away from every other title in the series. That is why I finally decided to go back and face the original again for this review – step one in a personal Sonic revival – maybe this time actually playing it more like a *platformer* and less like a trial for the land speed record in the Nevada desert. 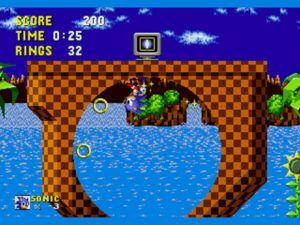 Sonic’s contributions to the game world has been well covered, so I won’t repeat them here, except to acknowledge that Sonic the Hedgehog essentially defined the Genesis. Early games barely differentiated themselves from NES or Master System offerings, and Sonic was the first to highlight obvious, tangible examples of things 8-bit consoles could not do. The Genesis wasn’t selling without Sonic, and it’s not a far stretch to think it never would have. The tech advancements extend into the gameplay as well. 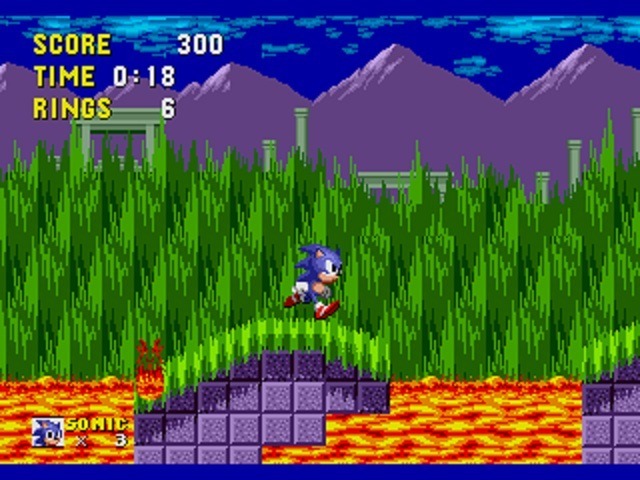 Levels are built with different vertical paths through them (with different hazards and challenges on each path), and Sonic can bounce between them or backtrack at will. Backgrounds scroll by with at least three different independent layers, adding depth to the surroundings. The improvements in resolution and color are apparent just by looking at the screenshots, but what isn’t so apparent is Sonic’s trademark speed. When the levels allow it, you’ll be smoothly rocketing around at 60 frames per second and exploiting Sonic’s unique speed-based abilities when you can. Control retains crucial simplicity. At its most basic, continuing to hold a direction will cause Sonic to build up momentum until he cranks up to a dash that lets him climb hills, leap higher, or even rocket through full stunt loops. You can also roll him into a ball by pressing down, allowing Sonic to crash through enemies and some walls without slowing down or taking damage. Secret paths can be uncovered this way, or groups of enemies can be bowled through; provided any level hazards don’t interfere. But the focus on technology and speed also clouds the game’s intent – this is still a standard platformer. You move from left to right, press one button to jump, and can defeat enemies by jumping on their heads. The speed the series prides itself on is really used more as a tool in Sonic’s arsenal than the centerpiece of a new way to play platformers. Speed becomes a way to navigate sections of levels and defeat enemies, but absolutely isn’t a way to win the game by simply running as fast as possible to the exit. This is something I didn’t grasp as a kid, and I failed to see how taking away Sonic’s speed made his game any different than any other platformer. The multiple paths and unique hazards are half of that answer, and realizing that you don’t take away Sonic’s speed by playing cautiously – you just use it in specific areas – is the other half. Zipping Sonic through loops or inside a giant pinball table are fun sections of an otherwise solid, standard platform title, not the entirety of the title. Sonic’s nemesis is the evil Dr. Eggman (changed to “Dr. Ivo Robotnik” for Western audiences to promote anti-Soviet hate in children ). Dr. Robotnik loves machines and despises nature, so he builds his various aggressive robots around captured woodland creatures. These automatons crawl, fly, and shoot like typical platform enemies, and the fuzzy critters within escape and hop away when Sonic smashes their metal shells. On the third and final stage of each level, Sonic does battle with a new device piloted by Robotnik himself, and which always seem to be vulnerable to shattering impacts of blue hedgehog quills. That’s a pretty big oversight to consistently make, Robotnik. Mario had his coins, and Sonic has his golden rings. Rings serve the dual role of ubiquitous platform collectible (nab 100 and you get an extra life) and clever health system. Any time Sonic takes a hit, he spills all his collected rings in an outward radius. The more rings you are carrying means a greater likelihood you’ll be able to use your brief post-hit invincibility to chase down and scoop up some of the dropped rings. Get hit with no rings on you, and Sonic loses a life. It’s similar to Mario’s system of losing your current powerup instead of your life, but a little more forgiving since you immediately have the ability to reclaim some rings. 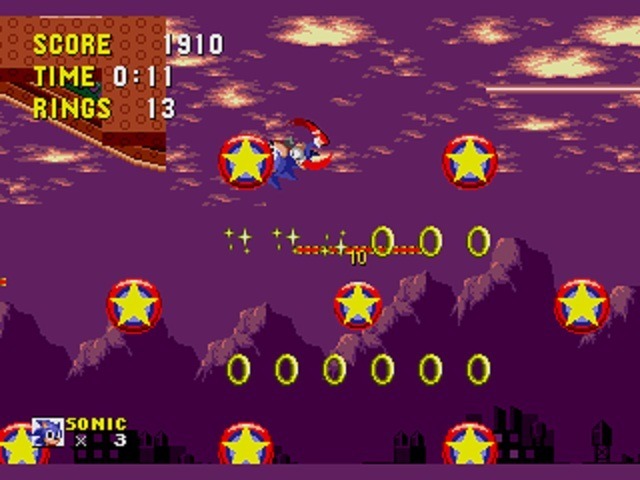 Hold on to at least 50 rings by the end of the level, and you can warp to a special stage where a rotating maze leads to one of six Chaos Emeralds (and the game’s “good” ending for collecting them all). Sonic‘s six levels (here, called “zones”) are also quite inventive. Mario’s levels were varied, but still relied on the same basic concepts and jumping challenges. In Sonic, meanwhile, just about every level introduces some new aspect to the game. Sonic bounces through the pinball table stylings of Spring Yard Zone, alternately avoids and uses fans for speed boosts in Star Light Zone, dodges and rides machinery in Scrap Brain Zone, and catches bubbles of air to stay underwater in the Labyrinth Zone. There’s no shortage of variety, and each zone presents its own set of challenges – some that require careful timing and pattern observation, others that rely on speed and momentum, and even one that requires maze-like navigation. So, is Sonic a better game than ‘lil J Man originally thought? Absolutely. Will I be checking out later games in the series? You bet. Do they add some form of saves or passwords in Sonic 2? God, I hope so. There’s more than enough Sonic collections for every game system available, even on Nintendo’s Virtual Console (delicious irony! ), so it’s worth taking the blue hedgehog for a spin if you’re curious about the series. The only caveat is that the ever-reliable Internets claim later Sonics are even better, so you might want to check those out before dropping your cash on his seminal outing. Pretty, well-designed, and fun sales pitch for 16-bit power. Easy to pick up and play. Good amount of variety. Sonic’s dopey friends aren’t in it. PASSWORDS. Where they at, Sonic Team? Speed must be carefully employed, but then I suppose it wouldn’t be much of a game if you just ran right through the levels. I used to be kinda dismissive of Sonic – once I slowed down to walking pace (after zipping past half the level) I found it fairly ordinary. Maybe I’ve been unfair on it. re: “Seriously, everywhere”, it is awesome that Sega are willing to make their classics available on multiple platforms. Nintendo doing the same is the greatest thing that will never happen to retro gaming… (obv. the companies are in quite different positions nowadays). Well, it’s not just that Nintendo will keep their games to Nintendo hardware, they also don’t seem that interested or invested in releasing the classics. I was tremendously excited about the Wii Virtual Console, until I learned that all games were locked to the console that downloaded them (and could never be re-downloaded without buying them again), and saw that the pricing was madness. I guess I can see $5 for a known and beloved classic like Zelda, but that price doesn’t inspire me to check out games that I’ve never played before. It seems they’ve given up on it anyway. VC releases are few and far between these days. Ah yes, the game I initially used to audition for JGR! That’s how much I like it. Green Hill Zone Act 1 is, IMHO, the best video game level ever designed, and also has one of the Top 3 video game musical themes of all time. Sonic 2 is equally as strong, but childhood memories give this one a slight boost in my personal ranking. My brothers and I grabbed a Genesis from a senior’s thrift store, and only later found that they still had the cartridges that were supposed to go with it (Sonic the Hedgehog 1 and 2 and some golf game which we used as our “test” cartridge) – funnily enough, we have paid more for cartridges each than for the console itself. I have to admit that I do not really care for Sonic because it is too fast. To be precise, because of the momentum. I find it really hard to jump on a platform and have him stay there, as Sonic will continue to slide along and then fall on his face. Combined with a lack of a save system, we have not really invested much time in it. 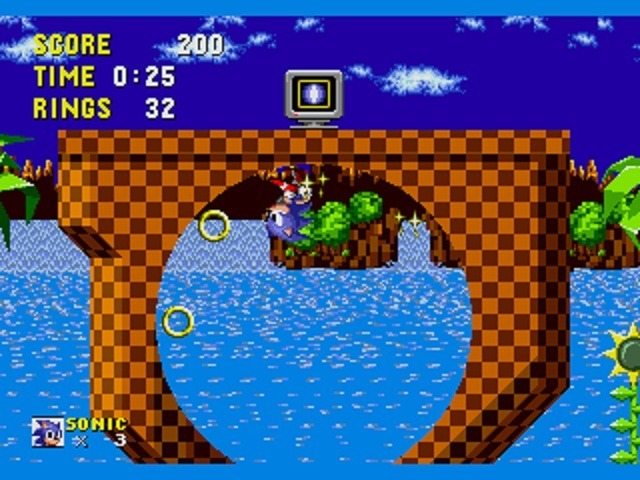 Sonic 2 on the other hand has the versus modes which we do enjoy, as buying the Genesis was our first introduction to console couch play with both this and Mortal Kombat II (having only ever played games on PCs). I actually prefer other Sega platformers (though have only played the PC versions, so that may be why), including the Disney ones (I played the PC demo of Lion King a lot as a kid), and still prefer the Apogee platformers to any console-oriented offering I have come across. Of course, I am of the generation which saw FPS as “the game” rather than platformers, so I suppose I will never entirely understand those who grew up playing the SNES and Genesis.